Trump Taps Montana Rep. Ryan Zinke To Lead Interior Department The first-term GOP congressman is a strong defender of public access to federal lands and has even broken with his party on the issue. But he also supports increased oil and gas exploration. 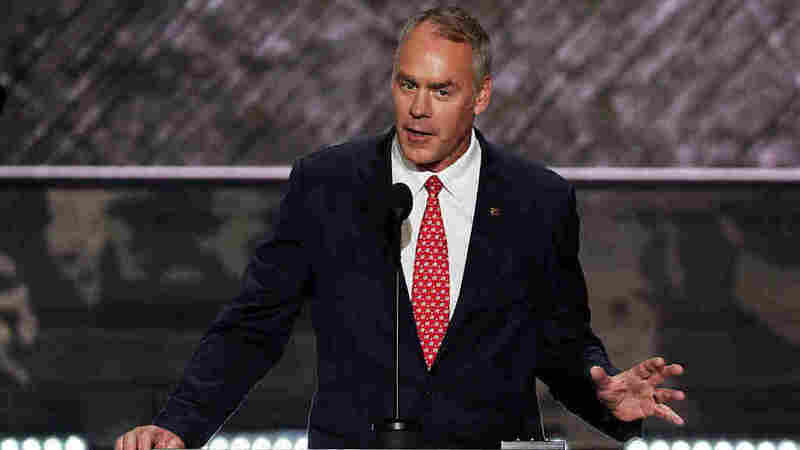 Rep. Ryan Zinke, R-Mont., spoke at the Republican National Convention in Cleveland in July. President-elect Donald Trump has selected Montana Rep. Ryan Zinke to be his interior secretary, the transition team announced Thursday morning. Zinke is a first-term congressman and a former Navy SEAL commander who served in Iraq and was awarded two Bronze Stars. He was re-elected to a second term last month with 56 percent of the vote. In the House, the Republican lawmaker serves on the Natural Resources Committee and has split with his party before to defend public access to federal lands. Zinke resigned his position this summer as a delegate to the Republican National Convention after the GOP platform supported transferring federal public lands to the states. "What I saw was a platform that was more divisive than uniting," Zinke told the Billings Gazette in July. "At this point, I think it's better to show leadership." Zinke still spoke at the convention in Cleveland in support of Trump, whom he endorsed last May. However, Zinke is overall not praised by environmentalists. He has just a 3 percent voting record with the League of Conservation Voters and is a supporter of coal, oil and gas exploration. He also backs building the Keystone XL pipeline. The interior secretary is one of the most closely monitored — and controversial — Cabinet positions, especially in the American West. The department oversees the management of more than 500 million acres of federal public lands, including close to 400 national parks and federal monuments, not to mention numerous dams and reservoirs. "I'm always reminded of that old joke that it doesn't matter who's elected president of the United States; it matters in the West when the secretary of interior is appointed," said Mark Trahant, a professor at the University of North Dakota. "That's the person who has the most direct say over our lives." Trahant, who is also a member of the Shoshone Bannock tribe in Idaho, predicted one of the top priorities of the next secretary under Trump will be to develop more oil and gas reserves, especially on tribal lands. Another equally controversial item on the department's agenda could be the federal government's overall role in management of all federal lands in the West. During the Obama administration, fringe Western lands groups on the far right — including rancher Cliven Bundy and his sons, who staged armed standoffs over cattle grazing in Nevada and Oregon — pushed for massive amounts of federal land to be turned over to the states and local counties. Zinke told Montana Public Radio recently that he is open to reforms in how the federal government manages lands, but he reiterated: "I have always been a strong supporter of public lands, and have voted against the transfer or sale of public lands. My position is known and well-established." Zinke has a bachelor's degree in geology from the University of Oregon, where he played on the football team. If Zinke is confirmed by the Senate, it could be a setback for Republican hopes to knock off Democratic Sen. Jon Tester in 2018. Tester is a top GOP target and Zinke was considered to be a strong challenger to the Democratic incumbent. Zinke confirmed a few weeks ago that he was considering a bid. In theory, Zinke could still serve but resign early to campaign back in Montana, and even use the position to boost his credentials against Tester. Still, for what's seen as one of the top opportunities for Republicans in two years, the lack of time to build a campaign and raise funds would be a setback. Trump had also considered House Republican Conference Chairwoman Cathy McMorris Rodgers, R-Wash., to lead the Interior Department, and many believed she was the likely pick, but a source close to the congresswoman said Tuesday those reports were driven by the transition team and that she did not receive an offer or a call from the president-elect. In a Facebook post, McMorris Rodgers said it was an honor to meet with Trump last week, but that she was looking forward to continuing in Congress, where she is the highest-ranking woman in GOP leadership.